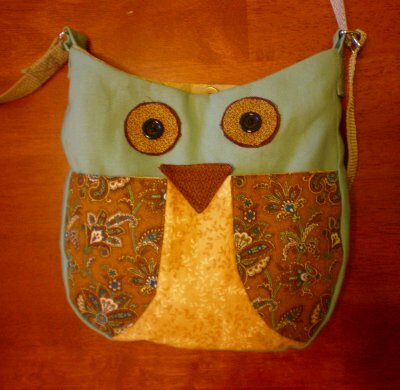 Here are the instructions for making an owl bag, like the one from this gift set. This tutorial is for personal and gifting use, please don't sell any that you make. Start by Creating a pattern. I simply drew the outline of an owl on brown craft paper. My pattern was approximately 15" wide by 22" tall (at the top points). Use your pattern to cut out two owl shapes from the lining fabric and one owl shape from the outer fabric. Next, you'll cut the pattern apart along the straight line across the owl's body. Use this to cut one top piece from the outer fabric and one bottom piece from the coordinating outer fabric. Next, cut the wings, eyes, and beak from the pattern paper. Use these to cut out the details from coordinating scraps. For the gusset (sides of the bag): Cut a 3 1/2" wide piece of fabric the length of the outer edge of the owl, starting from one top corner down around the bottom and back up to the top. I'm not sure how to better explain this step, but I took a piece of ribbon and laid it out around the large owl shape to get the length. You'll need one of these gusset pieces from the outer fabric and one from the lining fabric. For the strap: cut a 5"x42" piece of outer fabric. Attach heat and bond to back of wing pieces. Iron wing pieces onto owl body piece. Stitch around the edge. I used a simple straight stitch so that the edges will fray a bit and give a fun look. Sew top and bottom pieces together along straight edge (right sides together). Press seam open. Add the eyes and beak in the same manner as the wings. Sew the outer gusset piece to the front owl piece, right sides together. Once that is sewn, sew the gusset to the back outer piece in the same manner (right sides together). This step is much easier if you pin your fabric well. Turn the bag right-side-out: You're bag is taking shape! Next, sew the lining pieces to the gusset the same way you sewed the outside together, except REMEMBER TO LEAVE A HOLE at the bottom, to turn the bag right-side-out once the lining is sewn into the outer piece. Attach magnetic snaps to the center of the lining, 1 1/2" from top of lining. This is very easy, just follow the directions on the package. Good work- You're almost done! Make the strap: fold the 5"x42" piece of fabric in half length-wise. Fold in raw edges and press. Sew all 3 open edges closed. Sew ribbon to center of strap piece. Fold ends of strap under twice and center on the gusset, one side at a time and attach to bag, sewing in a rectangle, then an "x" in the rectangle. It's a good idea to either use a triple stitch, or go over this a few times to ensure that it's attached properly. I just realized this picture is sideways...sorry. If you make one, I would love to see a picture. I love this bag! In this Step: "Start by Creating a pattern. I simply drew the outline of an owl on brown craft paper. Use your pattern to cut out two owl shapes from the lining fabric and one owl shape from the outer fabric." What size is the Owl pattern, width and hieght approximately. Megan: Thanks for the question, I totally forgot to include a size! I'm going to add that to the tutorial right now! The measurments are approximately 15" wide by 22" high at the top points. Oh my goodness! This is so darling. 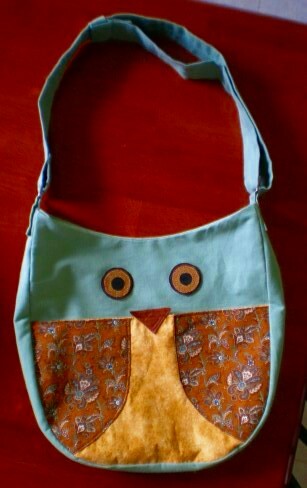 I love owls, and what a great idea to make a bag! I saw your lovely pattern on One Pretty Thing (just thought I'd tell you how I found you). Have a wonderful day, and thanks for sharing your tutorial. I, too saw your owl bag on One Pretty Thing. What an adorable idea! My mind is running off with ideas of other animal faces ...... thanks for the inspiration! What a great inspiration. I guess I will try one with some adjustments that just came to my mind when reading. Thank you for sharing! This bag is soooo nice. I want to sew it, as soon as all my other projects are done. I saw it on One Pretty Thing, too. Can i post a picture of my bag (when its done:) on my blog with a link to your tutorial? Brenda: Please do post pictures and be sure to leave a comment on here letting me know when they're posted, I would LOVE to see yours! I made the bag! I love it. Here is a link to my blog post, http://mm4ver-lifeinalaska.blogspot.com/2009/06/my-craft-project.html. Thanks again for the awesome idea Bethany. I can't wait to make this bag! Thankyou so much for this tutorial, I love owls! Normally most things I make are for my little boy- but this is definately for me!!! ahhh this is so cute! great job, i really love it!! may i post a few of these photos on my blog, and link to yours? i'd love to share it! if so, email me at jannypie.blog@gmail.com thanks!! holy smokes, i must make this!! This purse is so incredibly cute!! I want to make one now!! What a cutie!!! love the tutorial!!! Wow! So cute!!! This is going on my "list of things to make". Thanks for visiting my blog too!! Can't wait to make one! In fact, i may make two, one to keep, one to share. Thank you for the tutorial. I found you through traffic coming from your blog. I love this bag! I am adding this to my list of projects! Thank you for this, LOVE It. Can't wait to make it!! Thank you for this wonderful tut! I'm planning to make this bag. I think it is wonderful. I love your owl eyes. Is that fabric that has the yello lines? Is it embroidered? Please share your secrets with me!! Hi! Thanks so much for the tutorial - I just made one for a friend and can't wait to give it to her! I posted about it on my blog and linked back here - check it out if you would like to see a picture. I have changed it for myself a little. I like your bag a lot and the other day I made one for myself, too.I made a few additions though. Do come over and let me know what you think of my version! Great Bag Thanks for the Tut!! The bag is so cute. I make similar ones, only mine are small coin purses and I use the closing flap as the beak (a triangle flap that folds over, lies between the eyes and the tip snaps the whole bag closed). Seeing your big bag makes me want to try a larger version (in which I will incorporate the appliqued wings instead of stitching the curved pieces together which is so finicky). I will post on my blog (www.diffusible.blogspot.com) when I am done. Your blog is awesome!!! Cool project! I'm adding it to my to do list. So cute. I love owls... I posted about it on my blog and linked back here. This is impressive because I have a lot of bags at home but I had never seen those special designs, I'm gonna make one of them. Wow! I loved color green. Thanks for sharing this post about Green wedding celebration in Taiwan. I enjoyed reading it. Thanks a lot! Thank you so much for sharing this! Your instructions were excellent and so easy to follow. I made one for my sister for her birthday. I made the strap adjustable following the directions at Sew Loquacious. I'm planning to shrink the pattern to make a little bag for me! I just had to make this again! this one is mine, the Owl Bag, Jr.. It's only about 9" across. I can't wait to use it! I can't stop thinking about this bag. Every time I see a messenger type bag? the owl purse. Owls? the owl purse? browns and greens? the owl purse. I think it's time I attempt to make the owl purse. I already have enough matching fabrics to make a really cute (I hope) purse). Does it have to be heavy weight fabric though? Could I use quilt weight? (If that's the correct term)??? I loved this bag. I'm making owl wallets now and I was thinking of making owl bags and this one certainly inspired me. Thanks for sharing. Thank you so much for your inspiration! I was a bit lazy and used this owl pillow pattern http://weallsew.com/weallsew/files/2011/07/BERNINASnugglyOwl.pdf and think the bag turned out great! Your owl bag is adorable! I sell bags in my shop and I promise not to steal your idea. or sell the bags, but I'd like to make these for my friends for Christmas. I will add your site to the gifts. Too cute! I love sewing bags and i love coming across cute projects like this! My sons teacher loves owls so this looks like a great xmas present! HI, Thanks for the tutorial. I made one today for my son's first grade teacher. His class is part of the "Owl Team." It turned out great. Thank you. I don't see how to share a photo with you. I made this bag and it turned out great! Thank you! It was my first bag... I would love to send you a photo but I have no idea how? I came to your tutorial by following links from two sites. And I am happy that in the end, I have this awesome tutorial to see. Color combination and print designs are very beautiful. Started in 2013 to serve the best 3D games 3D player world was the site of a very short time. Category,online 3d games which has many different games 3D game on our site are suitable for all ages. Sincerely, this is one of the most captivating design blogs I have ever read. I believe that the readers who are familiar with the owl bags have the best experience. I am looking forward to getting such nice content through the experts in Editing Duplicate Web Content.